Posted on January 5, 2015 by Sabrina C.
Here is where I live. Everyone has heard of haunted houses. Some people believe there are ghosts living in the very house they stay. Others think the whole thing is just a hoax, either to add an interesting aspect to the property, or to scare people away. Many people are even afraid of moving into a new house or staying in a hotel room in fear of there being ghosts present. But what if there are not just ghosts and spirits you have to deal with? What if the house itself is possessed, is a living force with its own evil intentions? This story is about a boy, Connor, who moves into the house with his family ten years prior. He is overwhelmed with dreams of gore and demons and destruction and revenge. These dreams he doesn’t have a problem with. These dreams he sort of likes. And these dreams he can make a reality, with Amity’s help. Connor Webb, Amity’s next colleague and next victim. Gwen’s family moves to Amity, ten years later. They are hoping for a fresh start, a clean slate, given Gwen’s troubled past. But when she is haunted by visions and voices in dreams and while she is awake, she questions her sanity yet again. She can try to reach out, to warn her family about the dangers surrounding them, but with her past, who would believe her? And what could they do to save themselves? This is Amity. A normal, completely ordinary house, on the outside. When you step inside, normal is the farthest word from your mind. She will use Connor and Gwen to perform whatever task at hand she wants completed. To bring death and destruction as she has done before and continue to do again. And again. No one can stop her. Personally, reading a horror story is not as scary as seeing a movie about it. However, it would be very interesting to see this made into a movie. With all of the supernatural elements, the story could really be brought to life. Another thing about this story, it was based off of a true-crime story. Not only was the plot intriguing but the set up of the story was as well. One chapter will be about Connor and his days spent in the house, and the next chapter will be Gwen’s point of view for the same day just ten years later. It goes back and forth, telling the story from different people living the same day. This way it shows how similar their days are and how they correspond with each other. 28 days, 3:14am, red rooms, how does it all come together? Well, you soon learn “that there’s no such thing as coincidence when it comes to Amity (352)”. This entry was posted in Book Reviews and tagged horror, micol oscow, suspsense by Sabrina C.. Bookmark the permalink. this book sounds amazing! 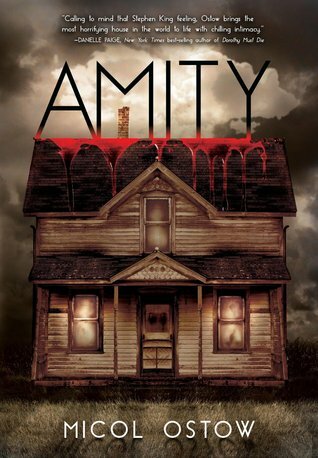 Ironic that Amity means peace. Can’t wait to read it!